Liquor Run Mobile - Liquor Run Mobile is America's #1 shopping app for alcohol, beer, and wine. We find the closest beer, liquor, & wine stores and remind you of area closing times. You make the Liquor Run! America's #1 alcohol shopping app. Get turn-by-turn directions to over 40,000 US liquor stores, browse thousands of drink recipes, and read descriptions of and get caloric info on hundreds of top beers. We even help you find a safe ride home at the end of the night. Best of all, never miss last call again! 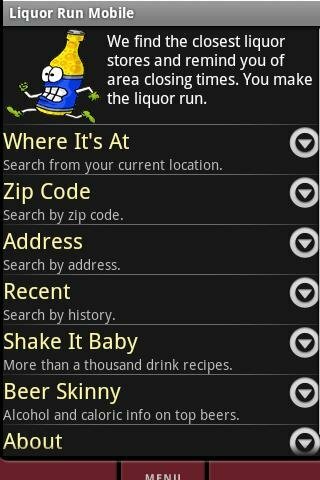 Liquor Run Mobile is the only alcohol-related app you need and it's completely free! We have over one thousand mixed drink recipes. You can also research hundreds of beers. Once you know what you want, use our liquor store search technology to find the closest great liquor store. Browse our Top 10 List, by type, or browse all recipes. Save your favorites to your favs list. We have great new search and rating capabilities coming in 2011. Sort hundreds of beers by calories or alcoholic strength. Each beer has a product detail page which includes interesting facts, stats, and a Beer Skinny review. It might not make you skinny, but you'll know more about beer! Search using your GPS, by zip code, address, or choose from a list of your recent searches. Results are displayed in a proximity ordered list (all stores within 10 miles are shown). You can press menu to show results on a map. Find out where your favorite new liquor store is. Call directly from the app, find out what times stores in the area must close, look up an address, or request turn by turn directions from your current location to the store. 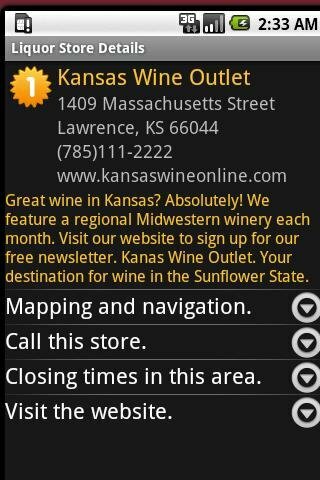 Certain stores also have extended descriptions and special offers good for Liquor Run Mobile users. We have lots of great new store features coming in 2011 so please check back often. If you find a store is missing, press the menu button and tell us about the store. We'll add it to the database soon. 5. Safe Ride. Search from hundreds of US Safe Ride programs. Liquor Run Mobile says, "Don't drink and drive, find a Safe Ride!" 6. Pass It Around. Liquor Run Mobile is completely free to use. If you love our app, please use Pass It Around to tell your friends about Liquor Run Mobile. Thanks for making Liquor Run Mobile America's #1 Shopping app for alcohol, spirits, wine, and beer. Keep checking back for updates!